I absolutely love all of Iain M. Banks’s books in the Culture series and I eagerly await each new installment. 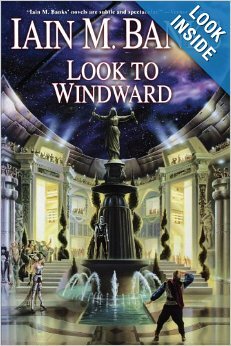 But Look to Windward is my absolute favorite – it has a particular place in my heart. I think that’s because this story touches some subjects that I can relate to. The story is set on Masaq’ Orbital, one of the Culture’s ring-shaped artificial worlds ran by an AI. It’s been 800 years since the Twin Novae battle which ended with the explosion of two suns, the destruction of countless planets and artificial habitats and loss of billions of lives. But the light of this explosion has reached Masaq’ Orbital only now, eight centuries later. So did an unlikely ambassador from another war-torn world, Major Quilan. Quilan’s official mission is to bring a renegade composer back to his home world of Chel. His true mission, kept secret even from him and implanted deep in the recesses of his brain, is to kill the Orbital’s AI. Why kill an AI would you ask? For revenge. Oh, not on this particular AI, but on the Culture in general. See, the Culture tried to intervene in the affairs of the Chelgrian society and, even though they meant well, the result was a civil war that cost their lives to five billion people. And now Chel is sending Quilan with the mission to assassinate Masaq’s AI who is also caring for five billion people placed in suspended animation. To the Chelgrians their death would balance the books. And all this happens when the light of a battle fought so long ago finally reaches the Orbital. In that battle too Culture played a role that, some say, precipitated the disaster. This is the intrigue (or part of it, because, as in all Banks’s books, there are layers upon layers of intrigue). But what made me love this book so much is the story behind the story, the hidden meanings and hidden feelings of all the characters. Quilan, Zeller and even Masaq’, the AI in charge of the Orbital, are surprisingly human, with their own baggage and skeletons in their closets, with their own nightmares and dreams and feelings of guilt and helplessness. And that makes them particularly endearing to the reader. In this book, Ian M Banks wanted to explore the consequences of our actions on us and other people and to see how different human beings cope with feelings such as rage, guilt, grief, etc. I think it rings very close to home right now with all that has been going on in Iraq and Afghanistan – both those conflicts scared a lot of people, be it the local population of the soldiers that have fought there. How do you continue living when you know that you are partly responsible for billions of deaths? Is anything you do good enough to counterbalance that? How far would you go for revenge? Masaq’ Orbital AI is a perfect example of that – 800 years ago he was the AI of one of the warships that participated in the battle and he witnessed firsthand the explosion of the two suns. The guilt had been haunting him ever since, and now, when the echoes of this battle finally reached the Orbital, he wants to make amends. How? By asking composer Zeller to create a beautiful symphony that would honor the souls lost in that battle, but also by not stopping Quilan from fulfilling his secret mission… And these are all the spoilers I am going to give. I love the world of Culture – it is incredibly complex and so well-detailed that it feels real. Every book in the series just adds a new piece to the puzzle, slowly building a beautiful picture of a star-dwelling civilization. Buy it, read it, enjoy it, pass it on.